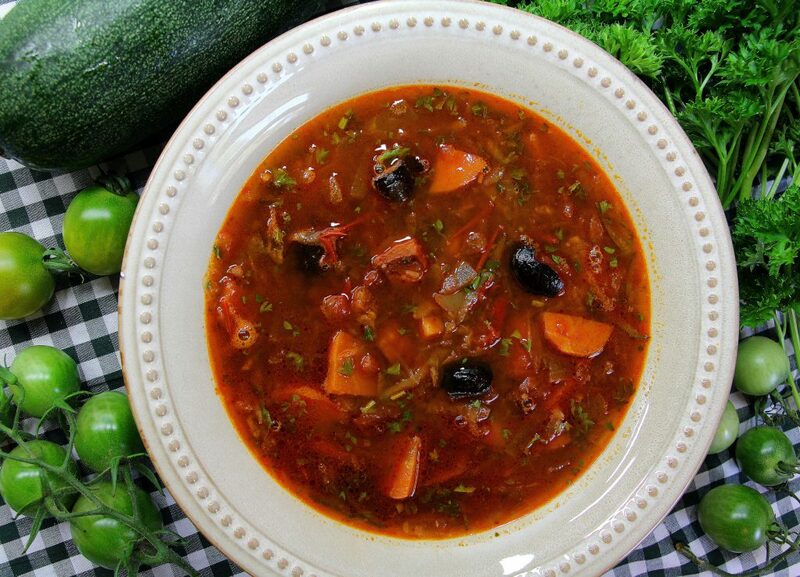 Green tomatoes, red tomatoes, turnip, zucchini, carrots, parsley, olives and ham in one bowl! This is a peak of the garden season soup. It is bright and savory spirit lifter, a treat for those who love it hot and, despite of the long list of ingredients, very quick to prepare. As we are living almost completely off land (which means we eat whatever we harvest, grow, forage or preserve in season), only a short period of time, starting from the middle of the summer, we can enjoy this soup made from freshly picked vegetables. Of course, I can few jars of it for the winter, but it is never the same. Melt couple spoons of ghee with paprika and hot pepper in a soup pot, add chopped red tomatoes, saute them for 10 minutes. Meanwhile, sear chopped onions in 2 Tbsp of ghee on a preheated skillet until caramelized, then mix in chopped carrots and continue searing for few more minutes. Add all to the pot with tomatoes. Add to the pot turnip, green tomatoes and sausages. Fill the pot with water and place on a stove to cook. Let it gently simmer for 20 minutes. Add grated zucchini, pitted and chopped black olives and parsley. Give it 5 more minutes to simmer and remove from heat. For even more zest you may add crushed garlic. Olives and sausages usually gives enough saltiness to the soup so there is no need to add more.